Turkey: Prime Minister Erdogan's democratizaton package legalizes letters that were banned for 85 years. Turkey Legalizes the Letters Q, W, and X. Yay Alphabet! 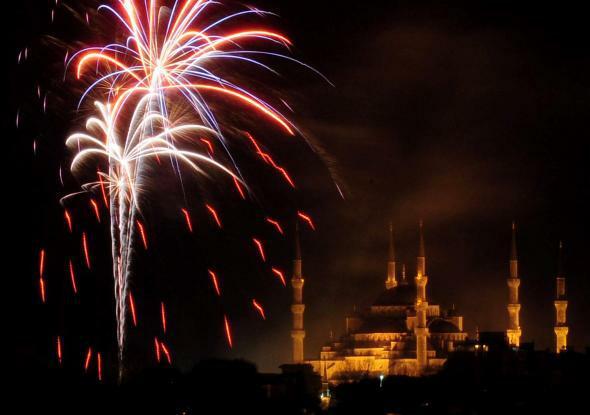 Fireworks explode over the Blue Mosque in Istanbul, Turkey. Back in 2005, a Turkish court fined 20 Kurds 100 lira (US$74) for holding up placards at a New Year’s celebration containing the letters Q and W. The use of those letters—and X as well—violated the law of Nov. 1, 1928 on Adoption and Application of Turkish Letters, the purpose of which was to change the writing system of Turkish from the Arabic-based system of the Ottomans to the Roman-based system developed under the secular, modernizing regime of Mustafa Kemal Atatürk. Now it’s true that Q, W, and X aren’t exactly winning popularity contests in any language, but what’s so repugnant about them that a law should exist to prohibit their very existence? Well, for starters, they appear in Kurdish but not in Turkish, and restricting a minority language—Kurdish has historically been spoken by 10-25 percent of the country’s population—is one way to oppress a minority. And although the fine represented a technically correct application of the statute, enforcement of the law was selective. Western companies routinely used the banned letters—in advertising and promotion— without consequence, for example in the case of Xerox Turkey, a longstanding, habitual abuser of the dreaded X. Or should I say formerly dreaded? After 85 years, the letters Q, W, and X have apparently been legalized as part of Turkish Prime Minister Recep Tayyip Erdoğan’s “Democratization Package” of Sept. 30, 2013. Great news for both the Kurds and Roman alphabet completists. At press time, the letter K said that it was glad to have its brethren back in the fold. Diphthongs, however, remain verboten.